Lake Texoma fishing has been very good this year, limits on every trip! But believe it or not it’s about to get better. Fall is here and with lows dipping down into the 50’s at night the water temp is dropping and the fish are getting more active. With each passing cold front we will get more and more gulls (birds) showing up on the lake that will lead us to schooling striper. Fall is one of my favorite times to fish on Lake Texoma, cooler temps, less boat traffic, and schooling fish so call me up and lets go catching. Once you locate the fish you can catch them on live bait or lures. Topwater lures (like pencil poppers) will work good until the water temp drops down into the lower 60’s then swim baits in a shad or minnow profile usually work better. My preferred swim bait is a 5″ shad body on a 1oz jig head in chartreuse glitter or glow. Live bait is king right now but as the water cools in November lures will usually out produce live bait. Fall is one of my favorite times to fish on Lake Texoma, cooler temps,less boat traffic, and schooling fish so call me up and lets go catching. Lake Texoma striper fishing is still going strong. Live bait seems to be the best way to go right now. Small fish are abundant but better fish can be caught if you can find them. Striper move a lot this time of year and don’t surface as much so finding them with sonar is key. Cooler weather is just around the corner and that should get the big fish moving again. We might see some topwater action after we get a cold front or two. Birds will show up with cold fronts and the striper will go on a bigtime feed in November and December. Lake Texoma is in full summer fishing pattern and for me that means trolling. You can catch some striper early in the morning before sunrise running close to the bank throwing top water or swim baits but once the sun starts to come up look for them schooling in open water — they won’t stay up long so better get them while it’s hot because once they go down they get a little tougher to track and catch. Slabs, swim baits, top water, trolling and live bait have been working but the key is to keep moving and stay in the fish. Lots of boats on the lake so lets all play nice and remember they are only fish. This is the time of year for less experienced anglers to get in on the action. May and June are prime time for fishing live bait and limits of fish can be expected on almost every trip. Plenty of hungry striper out in the deeper water from 25-70 foot so you can just drop live shad straight down, no casting required. Striper population is VERY healthy this year with lots of 18-19 inch box fish and lots of over 20″ fish up to 12 lbs. Action is fast and furious with a whole lot of catching and not much fishing. Fishing has been pretty tough with the wind and below average temps but it can’t stay windy and cold forever so we have some great fishing to look forward to. I believe a good number of our larger fish have moved from the lake up into the Red and Washita rivers to spawn, they usually show up back in the lake about the second week of May. Fishing is really hit and miss with the weather right now and many days have just been unfishable because of the extremely high winds. Its gonna be great fishing when we get a more stable weather pattern so we just have to be patient. Fish are anywhere from 10-60 foot of water but as a general rule the shallower you can find them the easier they are to catch and keep your eyes open for working birds. Live bait and artificial bait are both effective right now and topwater bite might happen in a couple more weeks. Its gonna be a season for the record books but we gotta get a warmer more stable weather pattern. Come on May !!! 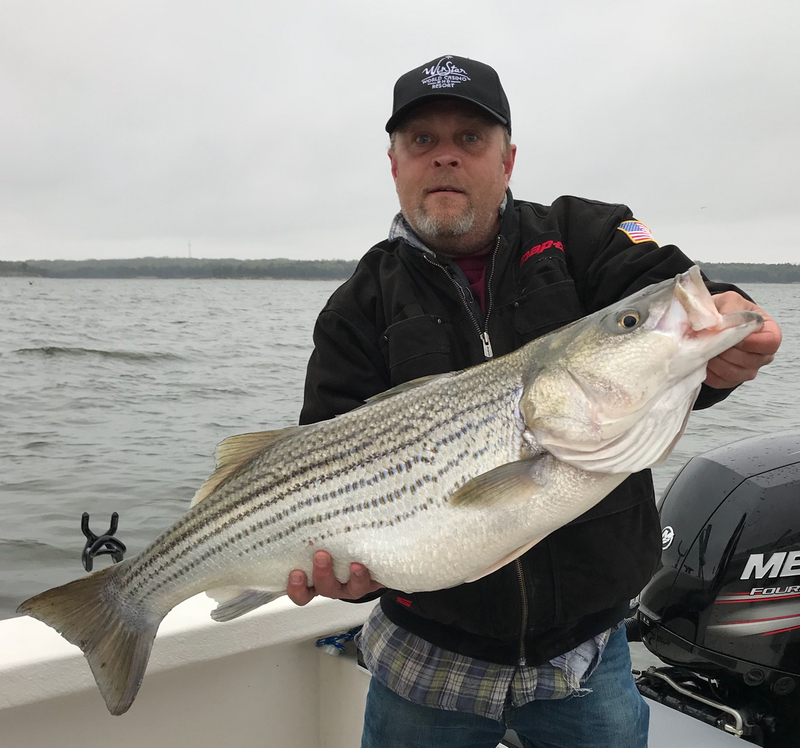 … Lake Texoma Fishing Report Tuesday April 3,2018. Lake elevation is 616.51 and water temp at the dam is 58 degrees. Fishing this time of year is up and down much like the weather but it’s like anything else in life you have to take a risk for the big rewards. I prefer 5′ swim baits in glow and chartreuse color this time of year but live bait can also be effective so for your best chance at a Texoma trophy striper book your trip now with your favorite Lake Texoma Striper guide and if you don’t have a favorite do your homework before you choose one. Lake elevation is 616.62 and water temp has warmed up to 57 degrees. With the water heating up the striper fishing just keeps getting better and should continue to improve as water temp rises more. Limits of box fish (striper under 20″) are being caught drifting live shad in the river channel and up on the flats. Larger fish are in a pre-spawn pattern and staged up on shallow structure in 10-25 foot. Lots of big striper caught last week and the pattern should hold thru early April. Trolling and casting swimbaits and A-rigs in the usual colors,chartruse and glow. Most of the action is midlake since upper ends of the lake are still pretty muddy. Flood gates are open releasing 6,0590 cubic feet a second but with the current lake level I look for gates to be closed at anytime and water should clear up on the upper ends but since it is spring time we could get more rain and more stained water. 2018 look so be the best fishing we have had since 2014 so get your Lake Texoma striper guide trip booked today. Texoma striper fishing slowed down during late Feb, But Spring is about here and fishing should improve a great deal. We need the water temp to move up in 50+ degree area — Currently it is in the 40s. As it warms up the bait fish (shad) will move to shallower water around the flats and humps. With Spring, we can catch stripers on pretty much any lure — swimbaits, jigs, Umbrella-rigs and live shad. If you catch the fish in deeper water try drifting live shad through the holding areas. But, it easier and faster if you can find fish in the shallows because they move in groves to the flats to feed on baitfish. Striper are much more aggressive in the slallows. 2018 looks to be a great year for striper fishing on Lake Texoma. A TPWD recent gill-net survey show the striper population increasing over previous years with a good number of 20 inch fish. TPWD biologists also said the 2017 survey had the highest growth rate ever recorded on Lake Texoma.